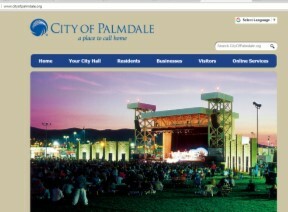 PALMDALE – Palmdale officials are in the process of updating the city’s website, www.CityofPalmdale.org, and they’re seeking input to help make improvements that will better serve users. “Whether you use our website for signing up for classes, buying tickets for a concert, applying for a job, or looking for general information about Palmdale and its services, we would love your input on what you feel should be the priority goals for the new website,” stated Director of Administrative Services Anne Ambrose. A two-minute survey with questions and the opportunity to comment is available at https://www.surveymonkey.com/r/PalmdaleWebsiteUpdate. This will be the first of several opportunities for community input as the new website is developed. 6 comments for "Public input sought for Palmdale website update"
As long as the site is professional. The mouse cursor should be replaced with a tiny pic of Jim Ledford’s head that users can use to navigate the site. The song “Never gonna give you up” should auto-play at full volume when each page loads, also a 30 minute video of the mayor and staff explaining how great the city is should also auto-play at the top of the page (also at full volume). Both the video and music should have no stop or pause buttons because those just get in the way, and besides, people will love hearing the video and music at the same time. The font for the entire site should be comic sans, the back button should be disabled and visitors should have to register and wait 2 days for a confirmation email. And 90% of every page should be ads for car insurance quotes and reverse mortgages. … things are so bad at the City of Palmdale, its city government officials demerit intellect or wherewithal sufficient to conceive, craft and design a proper city web site. Asking the potential users of a website what they think are priorities hardly seems like an admission that they lack ability. By and large I think the communications department does pretty well in their wide range of responsibilities, especially considering that they have a tiny handful of staffers. Of course I’m sure they would welcome you if you want to volunteer your services. Feel free to contact Trish Jones and let her know how eager you are to see the city improve. Why are you telling us? Tell someone at City Hall who can do something about it? -Code Enforcement when there is a front yard full of weeds or a totaled car parked in the driveway. -Graffitti Hotline when there is some on the block walls, street light posts or sidewalks. -The hotline for abandonned shopping carts. There are still problems now and then in my neighborhood but you don’t hear me kvetching about them on this site which is totally pointless. Got it, Jillian? Call City Hall and tell them your specific complaint about the website. They can’t read your mind. William is the town scold. So you tell on your neighbor by calling Code Enforcement, when maybe you could find out if your neighbor needs help with the weeds. No, William, you kvetch about everything else. Self-righteous jerk. Leave her alone. You’ve been complaining about this and that since 2011.